“The exquisite, the vulgar, from all walks of life they came”The European Avant-Garde: Insane or Insincere? Vincent van Gogh, Paul Gauguin, and Paul Cézanne were seen as the three forefathers of early twentieth-century avant-garde art. In fact, art critic Christian Brinton observed in 1913 that the “trinity of modern painting is comprised of Cézanne, Gauguin, and Van Gogh.”  And, when key Armory Show organizer Arthur B. Davies designed a chart showing the development of modern art to the present day,  all three artists were listed as precedents to the avant-garde period. For many, these artists represented a sharp break from tradition. 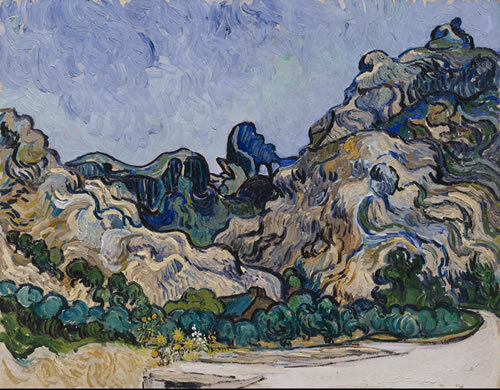 Van Gogh’s violent brush strokes and expressive colors shocked viewers, as did Gauguin’s savage use of color. Some found it difficult to understand Cézanne’s abandonment of realistic representation in favor of an image based on forms found in nature. In short, all three embodied a completely new spirit in artistic expression. And, the organizers of the Armory Show felt strongly enough about these artists to include eighteen works by van Gogh, twenty-four works by Gauguin, and sixteen by Cézanne in the exhibition. Cézanne’s oil painting, Colline des pauvres, fetched the highest price at the Armory Show, selling for $6,700 to the Metropolitan Museum of Art, New York, where it became the first Cézanne to enter the collection of an American institution. Frederick James Gregg, “A Remarkable Art Show,” Harper’s Weekly 57, no. 2930 (February 15, 1913): 13. Christian Brinton, “Fashions in Art,” The International Studio 49, No. 193 (March 1913): ix. Arthur B. Davies, “Chronological Chart Made by Arthur B. Davies Showing the Growth of Modern Art,” Arts & Decoration 3 (March 1913): 150.